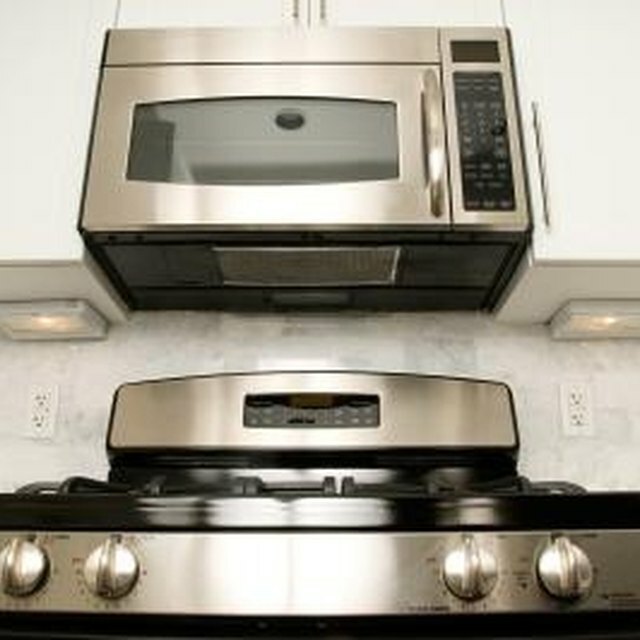 General Electric microwave ovens have a control panel on the right side of the oven. The control panel allows you to choose the cooking mode, oven power and set the cooking time. The panel also displays the time of day when the oven is not in use, and displays oven information while the oven is being used or programmed. If the control panel fails, the microwave will not function until a new one is installed. Unplug the microwave from the wall outlet. The microwave power cord is often located in the cabinet above the microwave. Open the microwave door, then remove the screw or screws securing the top grill. Remove the top grill once the screws are removed. Remove the screw above the control panel, securing the control panel to the microwave. Move the panel up to release the clips and pull it gently away from the microwave. Unplug the wire connectors from the rear of the control panel and remove. If necessary, take a picture of the wires using a digital camera to ensure that the wires are reconnected correctly. Connect the wires to the new control panel, then slide it down into place. Secure the new control panel using the mounting screw that was removed. Reinstall the microwave grill, using the screws that were removed to secure it. Close the microwave door, then restore power to the microwave.